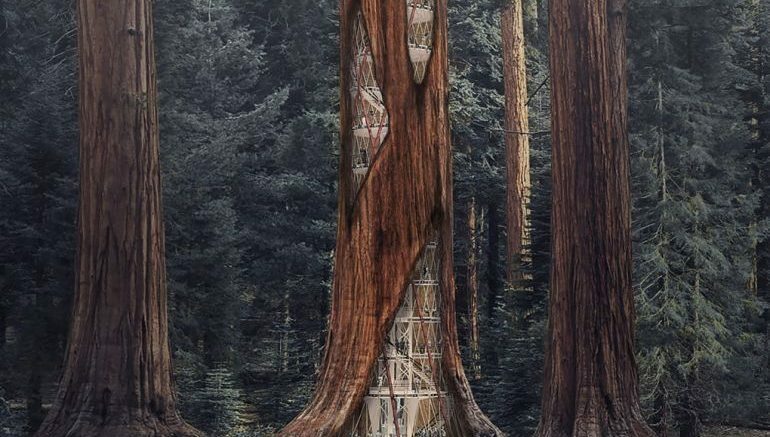 Fast-dwindling giant sequoia population has four South Korean designers turning to an incredibly creative solution: building skyscrapers inside hollowed-out trunks to keep rotting trees from toppling over. Aptly named Tribute: The Monument of Giant, the project is intended to educate people about this wondrous, now-endangered species, which is commonly believed to be the largest living organism in the entire world. According to the team, comprising of Choi Sunwoong, Cheong Changwon, Ko Jinhyeuk and Cho Kyuhyung, one of the main reasons behind the decreasing giant sequoia population is deforestation. The problem is further aggravated by things like global warming and climate change. 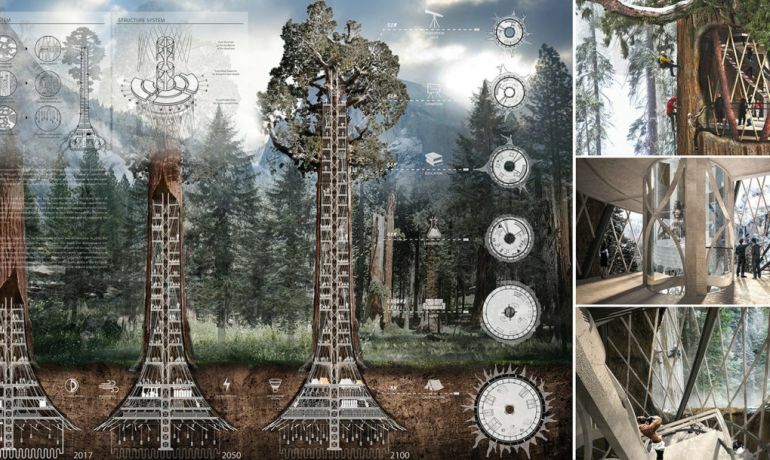 The new concept, which has received an honorable mention during the recent eVolo Skyscraper Competition, envisions a living, breathing skyscraper nestled within the rotted trunk of a dying tree. This project attempts to show a new architectural approach to human coexistence with nature. Instead of lessening the giant sequoia’s ancient beauty, the developers believe the skyscraper would be “active as an artificial organ to replace the trunks rotten away”. In addition to housing an observation deck, the space could be used for laboratories, research, education, exhibitions as well as photography. The exterior of the building will be encased within a lattice façade that in turn offers breathtaking views of the surrounding forest landscape.